Specialist Plaster of Paris Bandages and Specialist Plaster of Paris Splints use a manufacturing process that offers a consistent plaster that is uniformly coated and adheres to gauze. This formula provides minimal plaster loss to ensure maximum strength and a smooth cast finish. 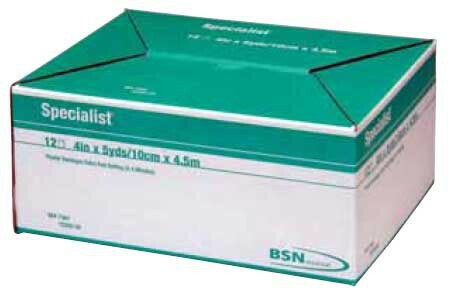 The Specialist Plaster of Paris Bandages and Specialist Plaster of Paris Splints are made by BSN Medical, the leading manufacturer of casts and splints in the world. Both come in two setting times: Extra Fast Setting of 2 to 4 minutes and Fast Setting of 5 to 8 minutes. Specialist Plaster of Paris Bandages and Specialist Plaster of Paris Splints are latex free. 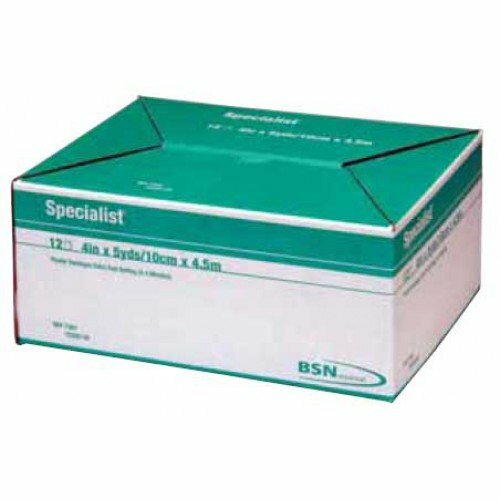 Specialist Plaster of Paris Bandage from BSN Medical is a consistent plaster that is uniformly coated and readily adheres to gauze. Offers minimal plaster loss to ensure maximum strength and a smooth cast finish. Provides high dry/wet plaster retention. Bandage Width Options: 2, 3, 4, 5, 6, or 8 Inches. Bandage Length Options: 3 or 5 Yards. Splint Length Options: 15 or 30 Inches.